Scaling and growing a business can be challenging, especially when you have a tight budget. My guest today will reveal effective strategies to help companies build a team without a budget, or with a limited budget. Today I’m talking to Delmar Johnson, president, and CEO of HR Brains for Hire. With 20 years of human resources experience, Delmar helps small and mid-size businesses get the right support in place. She believes sourcing the right people in the season is a delicate balancing act, but most certainly one that can be achieved. What are some of the strategies that companies can consider in terms of hiring when they have limited financial resources? What pitfalls do you see companies fall into when hiring interns? How do you determine what’s appropriate when bringing in an intern in terms of compensation? How can hiring an intern improve your business? Do you employ any interns right now? Why you need to invest in your business. 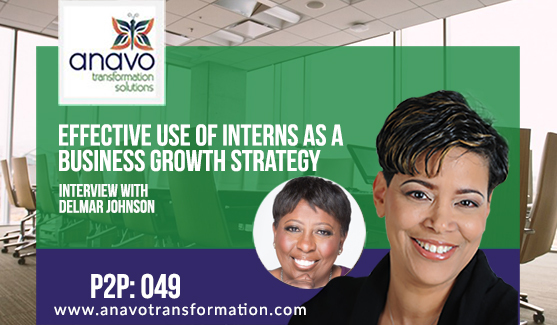 How you can utilize interns within your business. Advice Delmar has in terms of what kinds of interns to hire and where to find them. The responsibilities owners have when bringing in interns. The benefits of hiring someone without experience.